#3 Lemmy's Castle is the third castle in the game Super Mario World and its remake. It is guarded by Lemmy Koopa and can be accessed by completing Vanilla Dome 4. By completing this castle, the player gains access to the Cheese Bridge Area. The first part of the hallway contains some Magikoopas who cast spells at the Mario Bros. 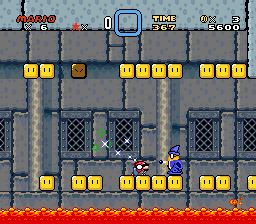 If these spells hit one of the many Rotating Blocks in the castle, that block will be transformed into a Yellow Koopa Troopa, a Thwimp, or a coin. After the Rotating Block section, the player will have to pass through a pool with platforms bobbing in the water. 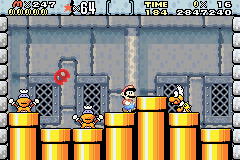 Here, a Midway Gate can be reached if the player hits the P Switch and reaches the closest door before the time limit is up. The second part of this castle is a long hallway containing several large blocks that move up and down in a set amount of time. In order to reach the other side, the player must move carefully in order not to get crushed by the large blocks or hurt by the Dry Bones that patrol this area. The boss fight against Lemmy. Lemmy jumps out of one of the many pipes that make up the floor of the room, along with two fake Lemmys. Mario must identify the real Lemmy and stomp on him three times to defeat him, all the while avoiding a Lava Bubble that is bouncing around the room. After a short cutscene depicts Mario destroying the castle by smashing it with a hammer repeatedly, Mario proceeds to the Twin Bridges, though it is possible to reach the Twin Bridges by completing Vanilla Fortress and therefore skip it entirely. This page was last edited on April 18, 2019, at 11:30.